As adults, we have around 400 to 800 man-made chemicals lodged in our bodies. Normal body elimination processes do not remove all these chemicals and in time our bodies begin to show signs of "aging". Food , drinks, polluted air, medications, stress, diseases, cosmetics, synthetics plus home and workplace chemicals all contribute to your body's toxin load which accumulates daily and builds up over the years. We invite you to take the time to look through our website and compare Acupeds to other foot patches. Do other brands have the same quality and variety of ingredients? Do they use starch filler? What percent of negative ions do they have from tourmaline (Acupeds use about 8% of pure tourmaline in each pad)? Are they USA based? Are they network marketing or direct sale from manufacturer? Do they offer excellent value or inflated prices? Do they offer professional after sales service, other detox products and discounts to preferred customers? 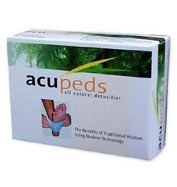 Acuped detox foot patches contain all natural, non-toxic, ingredients including Organic Agaricus mushrooms (high in Beta Glucans), tourmaline, Saururus Chenesis, Achyranthis Radix, Artemisia lwayomogi, Paeoniae Rubrae Radix, Caragana sinica, Siberian Ginseng, Platicodon Grandifloum, Mokcho Powder, Pearl Stone, Mugwort extract, Loquat (Japanese medlar) extract, and wood vinegar from mature trees.